I took a painting trip to Europe this summer. These paintings are two of several that I finished on site while there. Chateau Blonay was painted over the course of many days from the balcony of a friend’s place in Blonay, outside Vevey, Switzerland. The weather and light change very quickly in this area as it sits in the Alps just above Lake Geneva. You have to be very patient, and constantly ready to flee the rain while working. 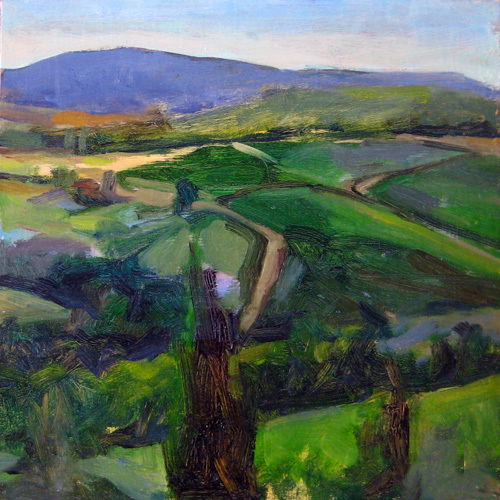 Outside Siena was painted in an olive grove looking across a valley in Tuscany. This painting was more direct and painted in a single session. The variations in light and color were remarkable. The colors in Italy were much warmer, and very different from the cooler light in the Alps. It was interesting to watch the shifts while taking the train from Switzerland south to Italy. Outside Siena • Joe Forkan 2009 Oil on panel, 10" x 10"
There are about 20 more small paintings in the studio that I began in Switzerland and Italy that I am still reworking . 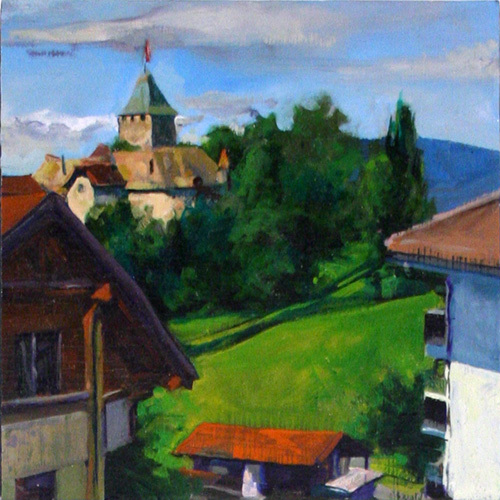 This entry was posted in Europe, Landscape Painting, Painting Trips and tagged Alps, Italy, Lake Geneva, painting, perceptual painting, Switzerland, Vevey on November 26, 2009 by Joe Forkan. These are gorgeous Joe!! Wish I could walk right into them. These are really beautiful–I love the colors you used! I’m looking forward to seeing the rest. Hi Joe, good to see the paintings with views from my balcony again…the colours are different again…now there are more greys there! I imagine it’s a little different in Blonay just now. Maybe just need a tube of blue and a tube of white. …a hot water bottle and a hot toddy too! cool paintings they look very realistic.